Now that my nduja salami is ready to eat, I'm excited to play around with different applications for this savory, salty, spicy pork butter. 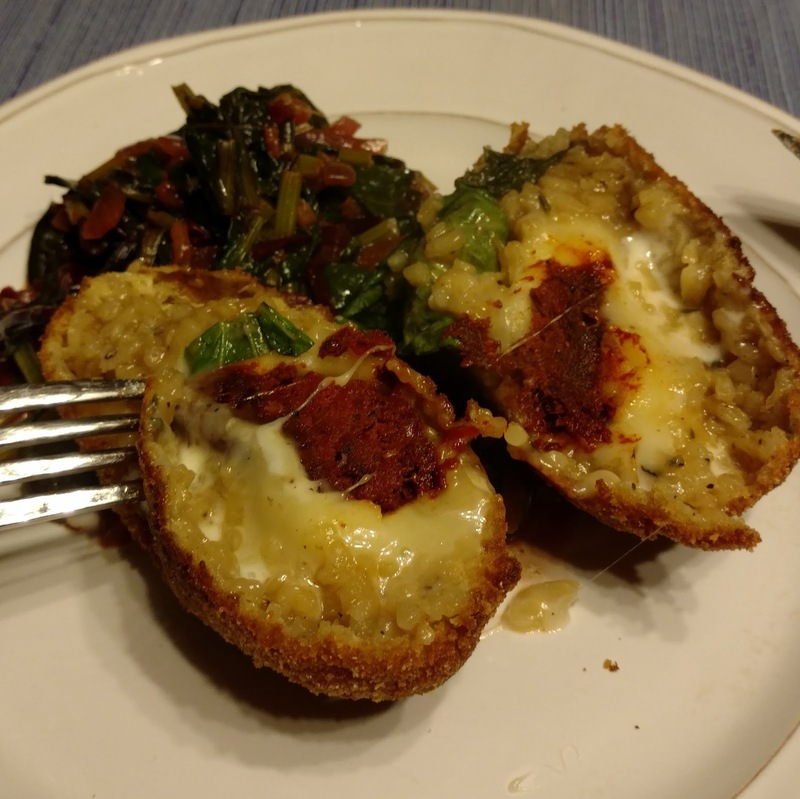 One traditional recipe is for arancini, fried balls of rice, cheese, and a tomato ragu. While some arancini are small, marble-sized hors d'ouerves, Calabria makes larger, conical arancini with a heart of cheese and nduja. 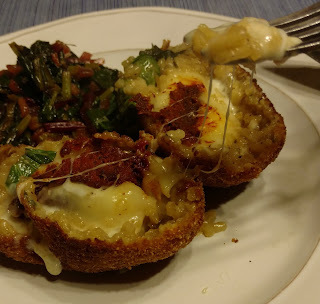 Showing Carla a video of someone cracking through the crusty shell of the arancini and releasing the gooey, cheesey innards, Carla put her hand over the video and declared "I don't want to see that again until I'm actually eating it!" So it began. I made a risotto using arborio rice, pork stock, and dry vermouth. 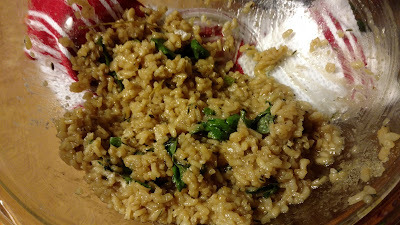 Once the risotto was cooked, I spread it into a large Pyrex mixing bowl to cool slightly. While the risotto was coming down to room temperature I took a nugget of nduja and packed creamy taleggio around it. 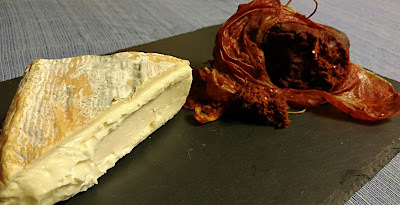 Some recipes suggested mozzarella or provolone, but I thought the funk of taleggio would be better match for the nduja. Next I packed the walnut-sized taleggio/nduja ball into a larger ball of risotto. Now this process seemed to be like making a Scotch egg of sorts. 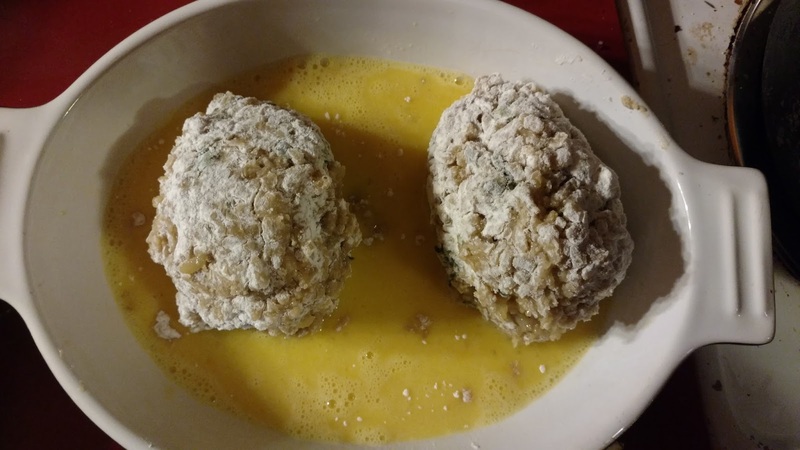 A roll in flour, egg wash, and breadcrumbs sealed up my growing-ever-larger arancini. I was a little worried about the risotto breaking apart in the fryer, but the risotto eggs held their shape perfectly. After about 7 minutes the arancini looked crusty and brown. Cutting each egg in half let out a gush of savory steam, scented with hot chilies from the nduja core. Served with sauteed Swiss chard (to make a desperate plea towards a healthy dinner) the arancini were fabulous. 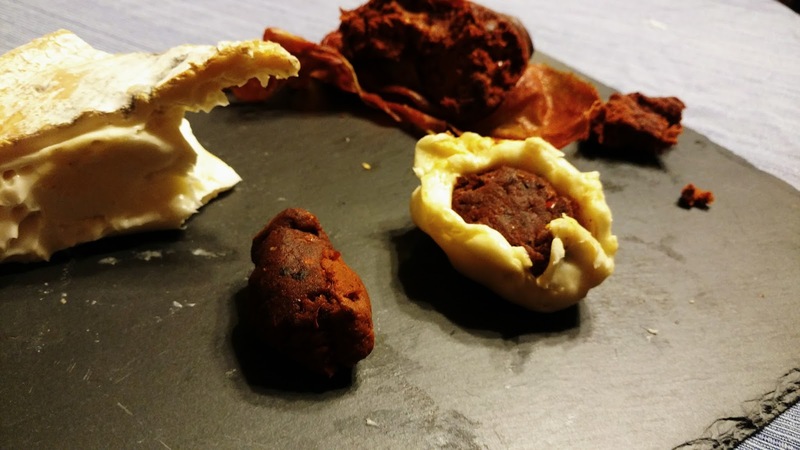 I'm hard pressed to think of something I would change about this recipe, but I'm curious how it would be if I inverted the cheese and nduja nugget. Would the nduja be runnier?